Successfully Added Portable GPS Navigation rPad with 5 Inch Touchscreen to your Shopping Cart. Welcome to the rPad, a new portable 5 inch GPS navigation touch pad with an intuitive animated 3D menu interface. The rPad, popularly called a "Road Pad" GPS touch navigator, comes with customer favorite features such as Bluetooth with name & number caller ID display, FM transmitter, AV input for your rear view camera, and 2GB Internal Memory! Simply put, the rPad GPS navigator is a world-class GPS system in the palm of your hand. Navigation: The rPad supports all your favorite GPS software which allows you to use such functions like voice directions, automatic re-routing if you take a wrong turn, 3D mapping, and day or night driving modes to make your daily driving easier and safer. Don't be late to work or any important appointments because of traffic problems, just use the rPad Portable GPS Navigator to reach your destination on time, every time! Bluetooth: The rPad lets you enjoy handsfree calling and communication. With the rPad's rich Bluetooth feature set, you can access your mobile phone contacts directly on the rPad's 5 inch screen, read incoming SMS messages, make one touch call backs, and best of all, the rPad displays the name & number of the caller when receiving an incoming call. FM Transmitter: The onboard FM transmitter makes listening to the voice and sound features of the GPS navigation easier than ever. Simply pair your cars stereo with the rPad via your FM Radio, and now you can listen to the sound output from your GPS navigation unit directly from your cars own speakers. This feature is extremely useful for anyone who drives on noisy roadways or simply wants to more easily hear if the navigator said turn in "5 meters" or "500 meters". Tablet and Media Player Features: The rPad Portable GPS Navigator is also a great PMP device. It is designed to be both portable as well as versatile in its use. Whether you're driving, walking, hiking or traveling to a new country, the rPad GPS navigator will provide you with both navigational functionality as well as entertainment value. It plays a multitude of movie and music file formats, includes a 3.5mm earphone jack, and has a micro SD card slot for adding up to 8 gigabytes of media files. Before you head out, load it up with all your favorite music, video, and picture files and enjoy your daily or special travels in style on the rPad's awesome high clarity 5 inch display. As always, Chinavasion only brings you the best of electronic GPS gadgets straight from China at a factory direct wholesale price. Click "Add to Cart" now, and we'll express ship you a sample straight away! 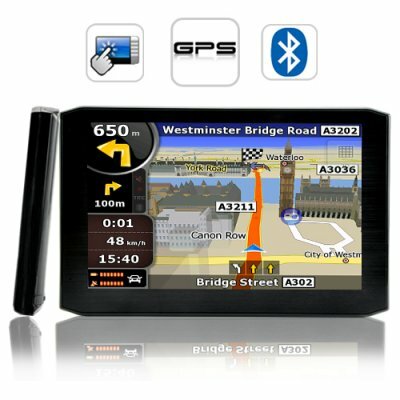 Special GPS Note: This model is compatible with most brands of GPS software, such as TomTom, iGO, Route66, etc. - however hardware specific software such as Garmin may not run on this unit. As the wholesaler, Chinavasion provides the GPS-enabled hardware only, not the software. Chinavasion provides no warranty or customer support regarding GPS software. Chinavasion cannot provide downloads / links / advice regarding GPS software. Any software installation you undertake should be performed or supervised by a professional. How does the Bluetooth display the caller's name and number when there is an incoming call? The Bluetooth feature will be able to display your callers name and number when you receive an incoming call, once you have transfered your phonebook contacts to the rPad GPS Navigator. Will I also be able to send a text message from the GPS unit itself? It's not really practical to be typing on a tablet when driving. After receiving an SMS, you can touch the Call Icon, if you wish to call the sender. The FM transmitter lets you listen to your favorite music through your cars stereo system. First, load your bonus your favorite digital media files. Then, load the FM transmitter application and tap the FM switch option. (Note: the frequency of the GPS unit FM transmitter and your cars radio must match in order to be able to listen to your music through your cars stereo system. Does the rPad GPS navigation also come with a rear view camera input lead? The rear view camera input, does not need any special installation. Just connect your personal rear view camera using a 2.5mm to RCA cable, and the rear view camera will automatically switch ON. on 2011-08-25 17:42:34 Great Product !!! This little unit was much better than I expected. Works perfect and is really quite easy to use. Didn't have any information or instructions in box, but when I powered it up I just followed on screen info...easy. Works great, very clever.